The Titanium 24kW Regular, condensing, gas boiler that has been designed and manufactured by Potterton. With a weight of just 19.5kg, this is one of the lightest boilers on the market, making it quick and easy to install, helping to save you time and money when it comes to the installation. Thanks to its compact size and the fact it can be wall-mounted, this unit can be installed into a standard cupboard so that it can be kept out of sight and out of mind, as well as it saving you that much-needed space in your home. As this is a Regular (Heat Only or Conventional) boiler, it needs to be installed as part of a heating system alongside a hot water storage cylinder, cold water storage tank and a feed and expansion tank. This means it is not really suitable for the smaller homes or properties where space might limited. This is a highly efficient boiler, shown by its seasonal efficiency rating of 93% and ErP A rating for heating and hot water. The output rating of 24kW, makes this boiler perfectly suited to medium-sized homes that don’t have such an excessive need for heating and hot water. Other outputs available in this range are 12kW, 15kW and 18kW so it you don’t require such a high output, there’s still a model to suit the heating and hot water demands of your home. Should you require a higher output, then there’s also a 30kW boiler that’s perfect for larger homes with 2 or more bathrooms. 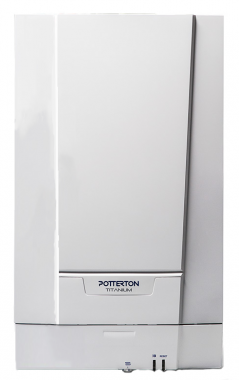 The many features of Potterton’s Titanium boilers include multiple flue siting options to give you flexibility with where it can be installed, it doesn’t require a pump overrun or permanent live which is ideal for boiler replacement and it also boasts front and side access for straightforward servicing and maintenance. Backed by a 7 year warranty, you can be sure that this is a boiler that you’ll be able to rely on for many years to come.